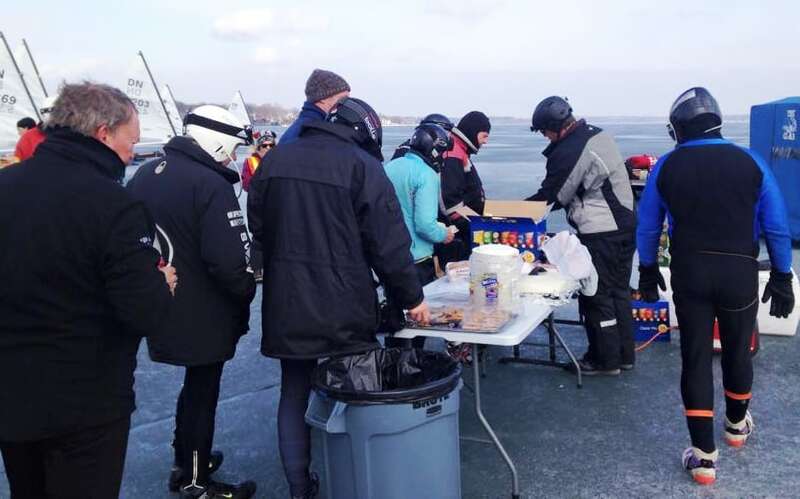 4LIYC members Don Sanford & Ken Kreider to the rescue with an on-the-ice lunch buffet at the 2017 DN North Americans on Lake Monona. 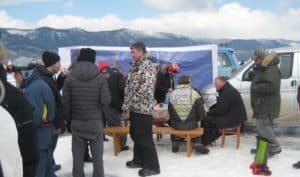 Here’s a reminder about a program about Lake Baikal ice sailing and social event and that the Four Lakes Ice Yacht Club and Hoofer’s is sponsoring on Sunday, October 14 from noon to 3 PM at the Memorial Union in Madison. It’s your chance to learn about ice sailing, adventure travel, Siberia, the 4LIYC, and meet ice sailors from around the world and Midwest. 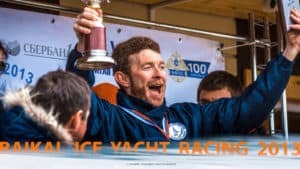 4LIYC Commodore Don Anderson called me this morning to talk about something that doesn’t get mentioned enough, how the friendships and camaraderie in iceboating are possible because it is such a unique sport. Bill Mattison’s classic line describing the sport,”nothing’s fickler”, can be a feature, not a bug, of iceboating. There’s an upside to the fickleness. Don talked about the differences between a soft water and hard water regatta. 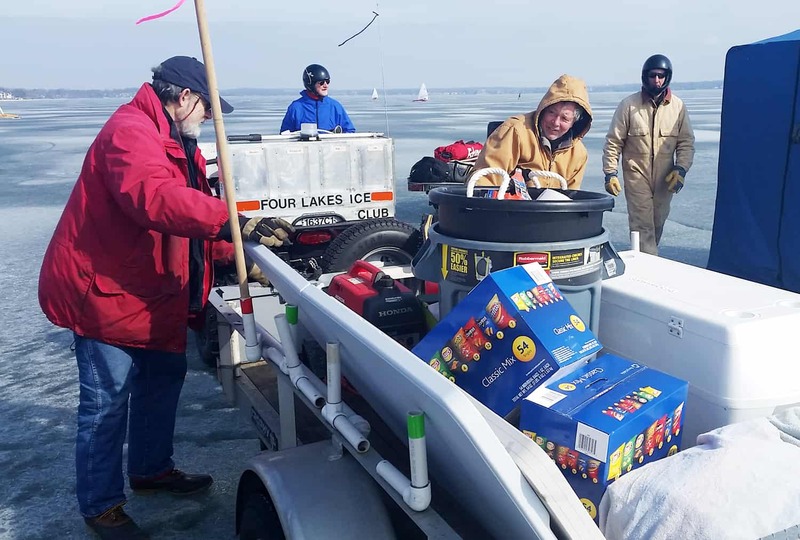 If conditions aren’t right, ice boaters are freer to get off the lake and explore their regatta destination making it more enjoyable for everyone. 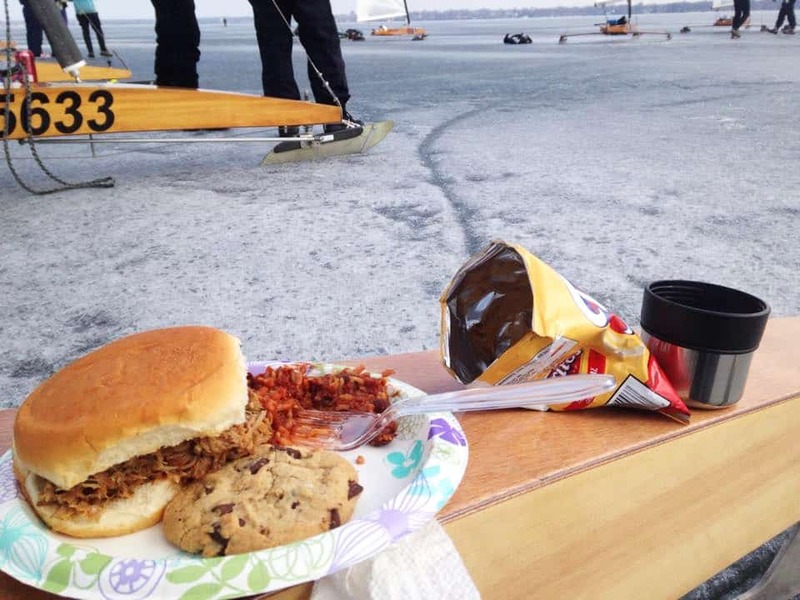 “Anytime I set up my iceboat at a regatta, getting to sail is a bonus. What makes it fun for me is renewing friendships with others who have this sport in common. The first iceboat ride you take of the season is worth the price of admission (i.e. owning an iceboat) because it is such a thrilling ride. Even if you don’t get another ride, it’s still a good investment.” Sharing morning donuts on the ice before a day of sailing, grilled brats at lunch, and a few beers at the end of the day with Tom Hyslop’s giant bag of peanuts- in-the shell makes iceboating festive sport. As these photos below show, iceboaters enjoy the social aspects of sharing a meal on the ice whether it’s on Lake Baikal or Lake Monona. If you are curious about the sport, we hope to see you there on Sunday so you can learn more about us. If you are a 4LIYC member or member of another club, we hope to see you there to begin the process of renewing old friendships. 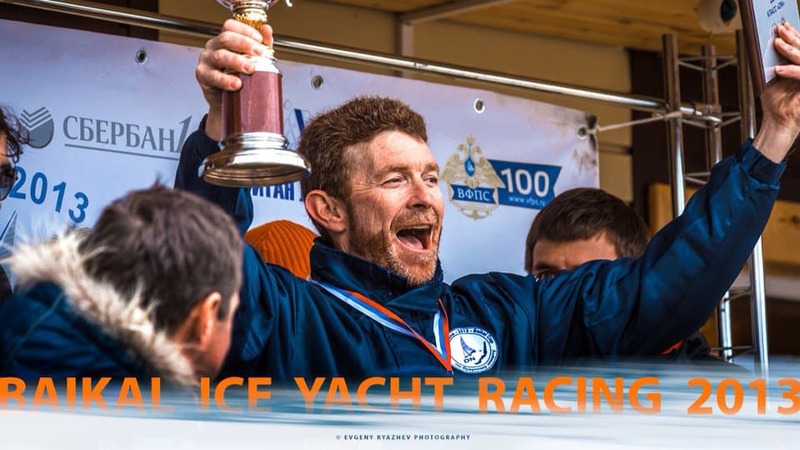 Multiple DN World, North American, and Baikal champion Ron Sherry is making the drive from Detroit, Michigan to attend this event and catch up with iceboating friends. Ron has been to Lake Baikal twice and has won 3 titles there and will be on hand to share his experiences. Food: Your favorite Wisconsin beverages and food will be available for purchase at Der Rathskeller and other restaurants located in the Memorial Union.